THE GRADUATE 2018 – IS ON ITS WAY! The 2018/19 issue of the annual Queen’s magazine for its 140,000 alumni around the world has been published. The Graduate features alumni updates and successes, showcases news from around the campus and highlights the achievements of staff and students throughout the last year. 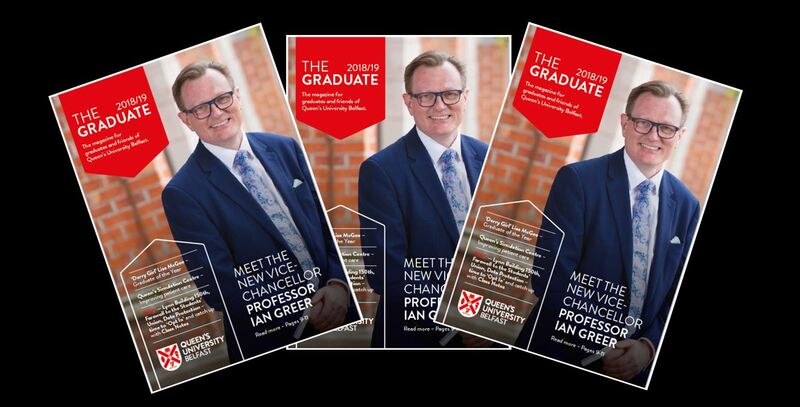 The 2018 publication includes a special interview with the University’s new President and Vice-Chancellor Professor Ian Greer (pp9-11), who took up post at the beginning of August. The impact of the University’s research on society, locally, nationally and internationally is outlined in the news section (pp4-8), where details of QFT's 50th anniversary (see also a special report by graduate Caitlain Rafferty here) can also be found. And in the fundraising segment (pp12-17) the effect of philanthropy on student life at Queen’s is detailed. The creator and writer of the multi award-winning ‘Derry Girls’ – Lisa McGee, BA Drama 2002 – is unveiled as the 2018/19 First Trust Bank Queen’s Graduate of the Year (pp18-19). Elsewhere in this year’s magazine readers can find out about developments in simulation based medical education (pp23-25), meet Eoin McMullan, the Alumni Volunteer of the Year (p29) and catch up with 150 years of the Lynn Building, now home to the University’s Graduate School (pp48-50). Commenting on the latest issue, Editor Gerry Power (LLB, 1982) said: “The Graduate provides a roundup of life at Queen’s and is instrumental in keeping our alumni in touch with their alma mater – and each other. “In the ever popular Class Notes section (pp36-41), graduates from each of the last seven decades share their news, and there’s a special appreciation of the life of our late Chancellor, Dr Tom Moran (p42). “Levelling the playing field (pp32-34), shows the extensive and important impact of the University’s widening access programme, which is already improving access to third level education for hundreds of talented young people from Northern Ireland, who may once have thought that a university education was not within their reach. “And Student News (pp20-22), the Legacy Update (pp30-31) and the notice of this year’s Convocation Meeting (p35), complete an extensive look at life at Queen’s – and for our alumni – over the last 12 months. “More importantly The Graduate showcases the huge achievements and contributions of Queen’s alumni to life in Northern Ireland and around the world,” he added. The latest issue of The Graduate is currently being mailed to graduates around the world; those who do not receive their personal copy by Friday 20 October (UK) or Friday 27 October (elsewhere) should contact alumni@qub.ac.uk. Alumni who have lost touch with the University since graduating, and who would like to receive a copy of the 2018 issue of The Graduate, can update their contact details on-line to ensure that they get future issues, and can email alumni@qub.ac.uk to request a copy of this year’s publication. Alternatively, an online version of the 2018 magazine is available here. Graduates wishing to stay in touch online can go to https://daro.qub.ac.uk/optin to let Queen’s know their preferences for ongoing contact from the University.